X-Pod was a sub-theme of Designer Sets from 2004 to 2005, and then later under Creator in 2006. It was released in three waves, with four sets in each wave. 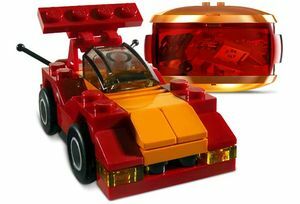 X-Pods are small round containers (with four studs on the top) which can be used to build on, or to store LEGO bricks. They were designed for portability, because, as the subtheme's tagline went: "The urge to build can strike anywhere: Now you'll be prepared!" They are about four inches in diameter, and two inches high, and are quite popular. They come in nine different themes: Automobiles*, Aircraft*, Animals (In general), Arachnids, Aquatic Life, Dinosaurs, Dragons, Monsters, and Robots*. The pods themselves come in three parts: Two lids of the same colour, and a clear container in the middle, which later became a transparent colour. Models from an X-Pod cannot be built simultaneously, and normally carry less than around 55 bricks. Using lids from a pod, or the entire pod in a model is quite popular as well, especially in combination models. In later editions of the pods, the instructions became foldable, and could fit inside the pod, but they included less models than the others. 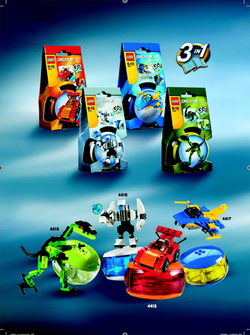 * The Automobile, Aircraft, and Robot pods were released twice as different sets. Robot Pod was also released in a black colour scheme for Halloween. LEGO invented a board game designed to be played with 2 X-Pods, called X-Pod Playoff. A set was also made to go with this game.